Headlights: Dipped headlights must be on at all times. Wild Animals: Elk and reindeer are frequently found on roads and are very active at the end of the day as the sun is going down. Warning / Emergency Equipment: Your vehicle should carry a warning triangle, reflective jacket and in winter have winter tyres. Toll Roads: There are no toll roads in the country. Winter Tyres: You must have these from December to February and engine heaters are sensible. 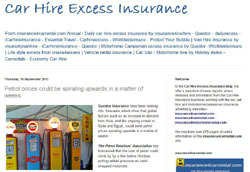 Check with your car hire company when you collect the rental vehicle in winter months.